Continuum of Selves will fuse jazz composition and performance with the metaphysics of personal identity and consciousness. I have attempted similar fusions before on my albums A Free Jazz Treatise (2003), Dark Metaphysic (2008), and Kooky Steps (2014). With long-term collaborator Sonja Morgenstern and other vocalists, I have developed a style which uses the human voice not to sing songs, but to allow jazz improvisation to draw inspiration from philosophical concepts. The voices act out parts which express these concepts, while exploring possible emotional reactions to them, thereby providing an added resource for the improvising instrumental soloists. The vocalists adjust their performances to the soloists, and become soloists themselves with wordless improvisation more concerned with emotion than melody. The result is not an esoteric conceptual statement. It is jazz – with all the excitement and harmonic, melodic and rhythmic attractions that word implies. But it is jazz with an added dimension. In these previous albums, I dealt with isolated philosophical concepts in individual tracks. Continuum of Selves, however, will have a unified philosophical theme; it will be a concept-album in an unprecedented sense. The theme derives from the metaphysic I develop in Philosophy in a Meaningless Life: A System of Nihilism, Consciousness, and Reality (London: Bloomsbury 2015). It will deal with the continuum of selves we rely upon in life, showing how our various socially constructed selves (e.g. for friends, family, in introspection, on the internet), are rooted in a limiting metaphysical conception. The compositions will represent this continuum through interrelated musical motifs, with the motif representing the metaphysical conception underlying each composition. I will also write a philosophical text which synchronises with the music using recently developed Booktrack technology: to be read as a musical e-book. And we will take the music out to live audiences. James was born next to a Royal Navy base in Portsmouth, first went to school in New Zealand, and grew up in Hereford in the West Midlands of England, where he discovered jazz at age 11. 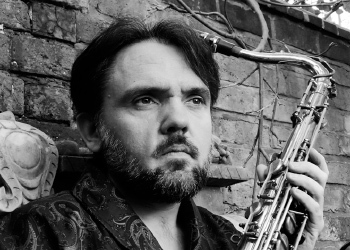 He began playing saxophone professionally in local rock bands at age 14, and won the soloist award in the Daily Telegraph Young Jazz Musician of Year Competition in 1991. Soon afterwards he recorded an audition tape for Berklee College of Music in Boston, USA. Berklee gave him a large scholarship that enabled him to study there for a year with saxophone legend George Garzone. James returned to London to study Economics at the University College London, but soon switched to Philosophy. He stayed on for a Ph.D. on the metaphysics of consciousness with Tim Crane and J.J. Valberg, and then secured a Lectureship at Keele University. He began to self-finance albums of his jazz compositions, and to make a name in the scholarship of philosopher Richard Rorty, publishing a well-known guide to Philosophy and the Mirror of Nature, a four-volume survey of the Rorty literature, and a collection of his early papers. James’s own philosophy is soon to be published as Philosophy in a Meaningless Life: A System of Nihilism, Consciousness, and Reality.